The U.S. Border Patrol agents are warning truck drivers that an increasing number of illegal immigrants are hiding inside the air flow vents of big rigs in order to cross border checkpoints undetected. Last week, at the checkpoint in Falfurrias, Texas alone, there were five incidents of border agents finding people hiding in the small compartments of big trucks. The week before that they found seven immigrants hiding together in one truck and they are now starting to find 2-3 cases per week on average. Omar Zamora of the US Border Patrol’s Rio Grande Valley sector says that the cases are becoming more common and it is speculated that the immigrants camp out at local truck stops waiting for unsuspecting drivers. "In many cases the truck drivers may not know anything about it, but what they can do and what we’re asking them to do is check. It will only take a couple minutes," Zamora said. Truck drivers may want to take this precaution seriously because often they will get cited whether or not they are aware of the fact that people are stowed away in their truck. One truck driver who spoke to Action 4 News said that this is exactly what happened to him and now he has a smear on his record because of it. "When I got to the checkpoint, they told me I had two people up there, and I didn’t know about it. I was so shocked. I was so scared. I didn’t know what to do. I didn’t know anything about it. Now, when I go to Mexico with my passport, they check me. They put me there like I'm a criminal or something. They check my record and stuff," he said. In addition to asking that truck drivers do their own checks before departing for the border crossing, the US agency has increased their own methods of combating the problem by placing cameras several feet off the ground to help detect any illegal activity. So far in 2015, the Border Patrol at the Falfurrias checkpoint has already apprehended more than 7,000 immigrants suspected of being in the U.S. illegally. 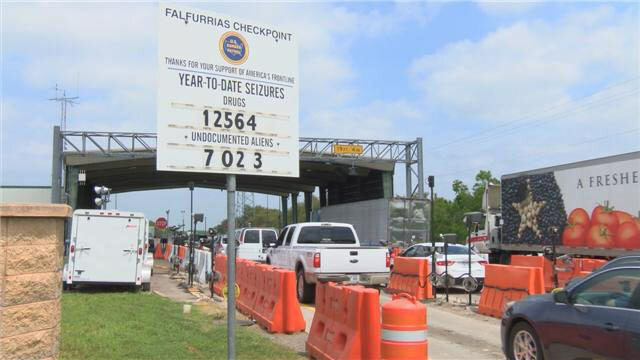 “Falfurrias checkpoint is one of the busiest checkpoints in the country with regard to seizures and apprehensions. In addition to that we also inspect more than 8,000 vehicles per day,” said Zamora. Agents also say that in addition to breaking the law, people are putting their very lives at risk by taking these bold and dangerous measures to travel undetected into the United States. "We don’t want anybody to die or get hurt or seriously injured," Zamora added. It's certainly no surprise that one bad experience was enough for the unidentified truck driver who spoke to the media. Now he says that he always ensures he locks up his truck and double checks to make extra sure that he has no surprise passengers onboard before taking off any where he goes. Walter Patrick is another truck driver who has no problem voicing his opinion on whether or not truck drivers should be held accountable. "If the driver is in on it, yes, lock him up and do what you got to do, but if he has no intention of doing anything like that I can’t see you citing him for it," Patrick said. What is your opinion on the matter? Is it realistic for truck drivers to do a complete check of their vehicle and freight? If people were detected hiding in your truck, how would you go about proving you were unaware of it?